Video playlist with 3 videos I made of an old Ginkgo tree at Maldegem (Belgium): Noordstraat 15, front garden of former house of Victor deLille. c. 1840, female, with chichi. 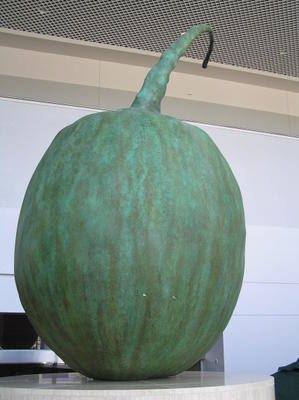 A huge Ginkgo seed "Ginkoberry Gwa" bronze sculpture by NYC artist Ming Fay at the Oregon Convention Center (MLK Concourse -Ginkoberry-), Portland, Oregon. 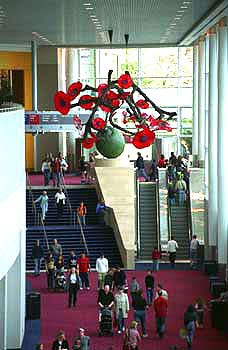 The interior street which joins the Oregon Convention Center has two 14ft high bronze Ginkgo seeds installed on the north and south entrances as the "pillar of time". Above them are three clusters of Gwa flowers (American mythological Gwakalekala tree). The artist was inspired by the Ginkgo forests of prehistoric Oregon. Ginkgo trees are lit up by 34 lights in Kumamoto Prefecture, Kumamoto city. Video by morihiro00 on YouTube. * New photo photospecial page: Old Ginkgo tree with chichi at Maldegem with 3 videos of this tree. * Added a photo of "Ginkgo leaves fall before the seeds". 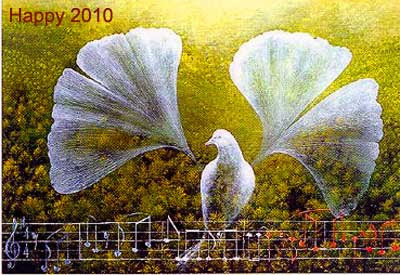 * Added Ginkgo Messenger project on my Art-page. Interactive: write your wish or dream on a Ginkgo leaf. Lovely girls and boys playing with Ginkgo leaves in Japan. Video on YouTube by Tubosumire. Beautiful Ginkgo trees in fall are admired by many people in Tokyo, Japan. Location: Meiji Jingu Outer garden. The trees are pruned into a small size because of toppling during the typhoon season in fall. 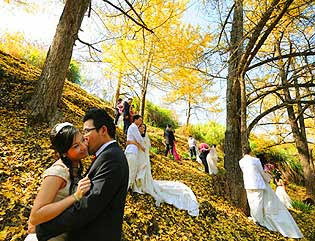 Couples in Zhongxian village, Yongxi county, Fujian province (China) take wedding photos amid a Ginkgo forest. * Added to my Tree-page a special page about the sudden falling of Ginkgo leaves. * New video: Ginkgo in fall impressions. * New photo photospecial page: Ginkgo trees in Amsterdam, Vespuccistraat + video of these trees. 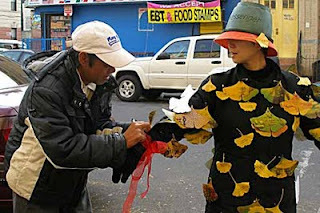 * New videos: Ginkgo rain: leaves fall all at the same time.